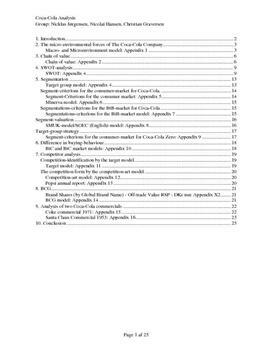 The purpose of this analysis of the Coca-Cola Company is to explain how the company has become a global market leader at the soft drink market, through detailed analyses of their chain of value, their choose of segmentation, a BCG-matrix and an analysis of their marketing strategies. To explain how they can retain their position as global market leader and how the Coca-Cola Company's future might look like, we made an analysis of their micro and macro environmental forces, a competitor analysis and a SWOT-analysis. Bemærk: Opgaven er skrevet på engelsk. The original Coca-Cola was invented in 1885 by John Stifth Pemberton. The product was called “Pembertons's French Wine Coca” and contained alcohol. But the year after the launch, the state of Georgia implemented a law which prohibited sale of alcoholic drinks. Pembertons solution was to make the product non-alcoholic under the name “Coca-Cola” . It was originally sold as a cure for hangovers at pharmacists. The formula has been kept as a secret since then. In 1892 was the Coca-Cola Company as we know it today established by Asa Candler, who bought the recipe and the rights to sell Coca-Cola. Asa Candler starts to advertise Coca-Cola as a refreshment beverage instead of medicine, and the strategy quickly became efficient. In the beginning of the 1900's the Coca-Cola Company sold 36 million bottles a year. But Asa Candler became old and decided to give he's children the stocks of the company he lived for. That was a bad decision. They sold their stocks to Ernest Woodruff. Four years later were Robert Woodruff elected president of the Coca-Cola Company and the company entered a whole new era regarding marketing, expansions of the company and exporting their product. Today are there consumed more than one billion Coca-Cola Company products each day, around 600.000 persons are somewhat employed by the Coca-Cola Company and Coca-Cola are the worlds most recognizable brand, which includes the company, logo and their unique bottle. Super god opgave, rigtigt godt formuleret. Materialer relateret til Analyse af virksomheden Coca Cola.